Here at Linens, Things and More… we love designing collections that are as unique and creative as our clients. 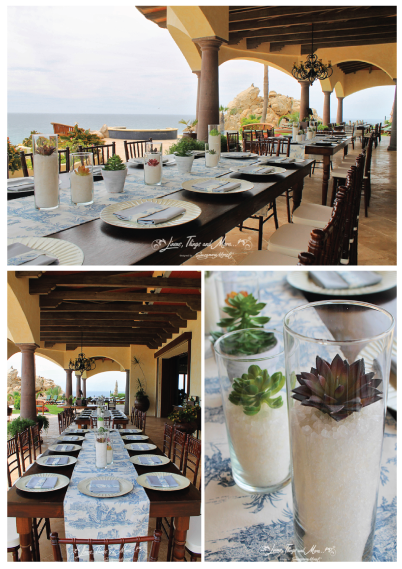 Recently, we had the pleasure of doing a special set-up for the ladies of Pedregal, Cabo’s exclusive private community. This gorgeous luncheon took place at the beautiful Villa Celeste, and it was the first time we incorporated our new French country print in a décor design. The country print table runners and napkin bands looked trendy and fresh against a crisp cornflower blue napkin. Our bone-colored chargers and a few succulent centers also provided a nice contrast with the dark wood tables and chairs. 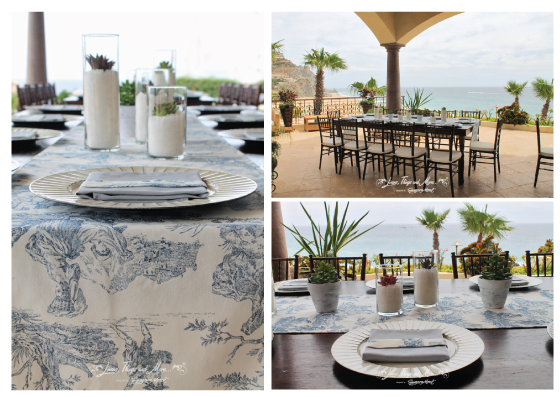 Add the stunning Pedregal views, and this luncheon look was complete! We kept this décor design minimal and a bit rustic so the real focus was on the natural beauty around us. Remember, Linens, Things and More… designs custom décor for weddings, dinner parties, breakfasts, luncheons, holiday parties and so much more!! We also offer rentals if you simply wish to add a few special items to an existing hotel or villa set-up. Call us today at (619) 819-9180 to find out how our inventory and design team can best serve you! This entry was posted in Accessories and decor, Cabo event design and decor, Cabo Villas, Special Event Decor in Cabo, Weddings and corporate events decor and tagged bone colored chargers, Cabo event design, Cabo event rental, catered lunch in Cabo, decor design, destination wedding decor, French country print fabric, light blue decor palette, linen design, Mexico party rentals, Pedregal Los Cabos, private dinner in Cabo, private lunch in Cabo, rustic decor, succulents, views from Pedregal Cabo, Villa Celeste Cabo.